Trials HD has taken the Xbox Live Arcade by storm in the last year, garnering critical acclaim and record sales on the platform and yet there is little sign that the game will make an appearance on iOS, or any other smartphone platform for that matter, anytime soon. So, Xtreme Wheels has stepped up to fill the boots of a game that would seem perfectly suited to playing on the go, and it does fill those boots very well, although a number of minor issues prevent it from really replacing Trials HD completely. 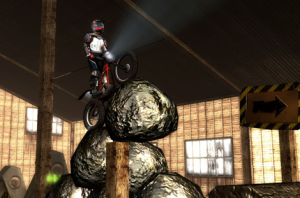 Xtreme Wheels is a side on 2D motocross simulator with pseudo 3D graphics and lots of over the top stunts and tricks. The game is centered around controlling the motorbikes speed and its center of gravity by having the rider lean forwards or backwards. Yo can control his position with either an analogue stick, digital pad or by tilt. Analogue is by far the most responsive and intuitive, although it is nice that there are different options on offer. The bike actually controls pretty well, although if I’m honest it doesn’t feel as natural as Trials. This is understandable due to limitations of the Touch screen, but I still feel it could feel a little better. The bike just feels as if it overreacts a little too much, especially when leaning back. It is not a deal breaker by any means, but it should be noted by potential buyers. 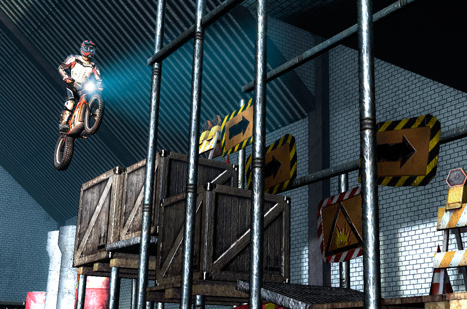 You ride over a series of ramps, jumps and other obstacles, and while it is tempting to go full throttle at all times, you must be careful as it is very easy to kill or maim your hapless rider. The comic nature of the way he dies helps to alleviate the frustration of squashing him for the tenth time. Getting the bike at just the right angle when you land is the real key to speed as well as learning that going slowly on certain sections is the wisest choice. It is great fun navigating the courses on your Trial Bike, and in many way is one of the best experiences on the App Store, it is just a shame that a couple of niggles spoil the game somewhat. The first problem is the frame rate. While the graphics are undoubtably impressive, especially on an iPad 2, the frame rate can be a little choppy at times. Again it isn’t a massive problem but it is a little bit disappointing. The other thing is the fact that the whole game is a little dark. 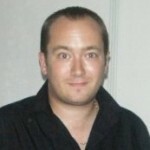 It isn’t the colour scheme or anything like that, it is just as if the iPad has had its brightness turned down to much. We tested on both an iPad 1 and 2, and the problem remained. Very odd. Another, bigger problem is a lack of content, as while there are twenty tracks included, I honestly feel this isn’t enough, and there should definitely be a few more than that to add some much needed legs to the game. The problems that I have mentioned shouldnt take away from the fact that this is a very good Trials HD clone, with really nice graphics, some really fun and addictive gameplay. It’s problems are all small, but they do add up. I would love to give this a higher score, I really would, as this has all the hallmarks of an excellent game. I just wish the developers has tweaked the small problems and added a few more levels. This still comes recommended as probably the best game of its type on the iOS App Store.